This section covers an explanation of what compulsory basic training is (CBT) and many of the frequently asked questions asked by learner riders. What is compulsory basic training for motorcycles? Compulsory basic training for motorcycles is a training course developed to provide novice moped and motorcycle riders with the basic skills required to proficiently control and maintain the vehicle. The course also includes riding techniques, road safety training and advice on appropriate clothing and legal requirements. When was compulsory basic training introduced? Does every rider need to complete compulsory basic training? If you gained a full driving licence before 1 February 2001, then you’ll not have to complete compulsory basic training, though this basic entitlement allows only for mopeds to not exceed 50 cc. If your full car licence was issued before February 1st 2001 and you want to ride anything bigger than a 50 cc moped, you’ll still need to complete CBT. 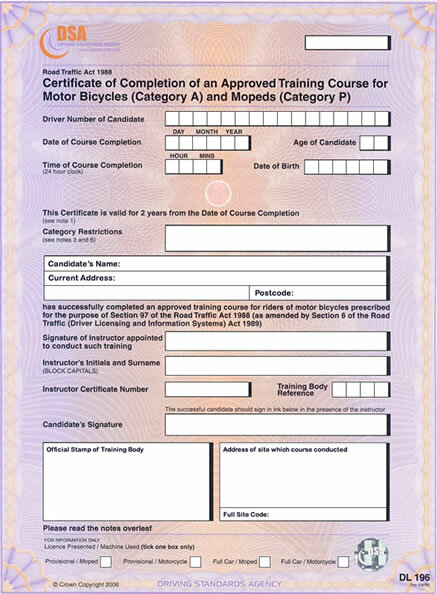 Any licence obtained after February 1st 2001 means completing CBT is a legal requirement before an individual is permitted to ride a moped or motorcycle legally on public roads as a learner rider. Is there a test at the end of compulsory basic training? Compulsory basic training isn’t a test, it’s a training program only. Therefore there is no test at the end of CBT. Can you fail compulsory basic training? As CBT isn’t a test, then technically you cannot fail. At the end of successfully completing CBT, you’ll receive DL196 which is essentially a document that has been signed off by the instructors providing proof that you have successfully completed all elements of the program. 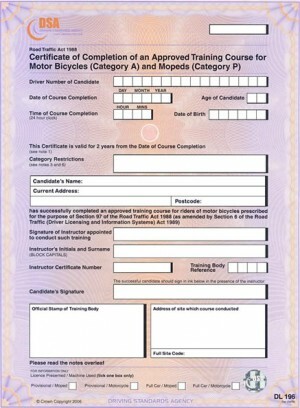 So although you cannot fail compulsory basic training, to complete the course you’ll need to obtain the DL196 certificate. Though technically you cannot fail a CBT, if you don’t receive your certificate after your day of training, you’ll most likely feel like you failed the ‘test’. See Can you fail CBT? How to fail a CBT for an example of the most common mistakes that result in candidates not receiving their certificate of completion. What can I ride after passing CBT? The vehicle you are entitled to ride is dependent on your age. After completing CBT at 16 years of age, you can ride a moped not exceeding 50 cc and from 17 years of age upwards, you are entitled to ride motorcycle not exceeding 125 cc. Will I need L plates after completing CBT? CBT isn’t a test. CBT is a training program that prepares novice riders with basic skills to ride safely on public roads as a learner. As you are a learner rider, you will need to display L plates. Both must be clearly displayed, one at the front and the other placed at the rear of the vehicle. What does compulsory basic training consist of? Element A: An introduction into CBT. It will comprise of a discussion, explaining the course and an eye test. Element B: An introduction to the motorcycle / moped. No riding is conducted at this stage. Element B will involve gaining familiarity with controls and handling the vehicle. Element C: Introduction to riding off-road. Here you’ll begin riding the vehicle. Practicing moving off and stopping, turning and traveling at various speeds and changing gears. Element D: On-road preparation. Here you’ll prepare for the final on-road riding element. This element will cover the Highway Code, road surfaces, weather conditions, legal requirements and various other safety aspects of riding the motorcycle. Element E: This final element will see you take to the road on your own vehicle, accompanied by your instructor who will be in constant radio contact with you. How long does CBT take to complete? All elements must be completed in order and signed off by the instructor. The entire course is usually taken over a single day and consists of around 6 to 8 hours (see how long does CBT course take for breakdown on each element). If you feel this is too much for one day, you can split the course over 2 days if you prefer. If you haven’t successfully completed all elements, you can arrange a return to complete training. Will I be training with other learners? Upon completion of the course, your CBT certificate will be valid for 2 years. Within this 2 years, you’ll need to have passed module 1 and module 2 tests to have obtained a full licence. If you haven’t obtained a full licence within 2 years, you will need to complete CBT once again. Who conducts compulsory basic training? There are various trainers around the UK. The Driver and Vehicle Standards Agency (DVSA) conduct the module 1 and 2 tests but do not directly provide CBT training. Training establishments have to become a DVSA approved training body in order to conduct CBT training. Only authorised trainers can provide CBT. To find a local CBT provider, see here. What do I need to attend a CBT course? You will need to take your provisional drivers licence and to wear appropriate clothing and footwear. You may be provided with a helmet, jacket and gloves though you will need to ask your trainer on the specifics. An eyesight test will also be conducted at the start where you’ll be required to read a number plate from a distance of 20 metres. If you use eyesight corrective wear such as glasses or contact lenses, you’ll be required to wear these throughout the riding elements of your training. Please note, if you fail to read a number plate from the prescribed 20.5 metres, you will be given the opportunity of reading an alternative number plate. Ultimately if you are unable to read a number plate from 20.5 metres at all, your training will be terminated and you may lose your fee. Do I need to take my own motorcycle for CBT? Most training establishments will permit you to use your own motorcycle though if the vehicle is not up to the minimum legal requirements you’ll be unable to continue on this particular vehicle. Many trainers provide the option to hire a moped or motorcycle for use on your compulsory basic training. If you hire a vehicle from the approved training body (ATB), they will also provide insurance. Can I do CBT if I’ve never ridden a motorcycle or moped? CBT is based on the assumption that you have never ridden a motorcycle or moped before. Any previous riding experience may be of benefit but not required. It is highly recommended however that you have a basic understanding of the Highway Code and road signs. Do I need to have completed the theory test before taking CBT? You do not need to have passed the motorcycle theory test before taking CBT.